RDS Simmonscourt pavilion was abuzz today as the ‘all-Ireland final of skills’ kicked off with 125 talented apprentices and trainees getting stuck into a marathon, three days of competition. Ireland Skills Live is showcasing the “best in class” in 25 different disciplines covering a spectrum that includes beauty therapy, construction, cooking, visual merchandising, aircraft maintenance and cloud computing. 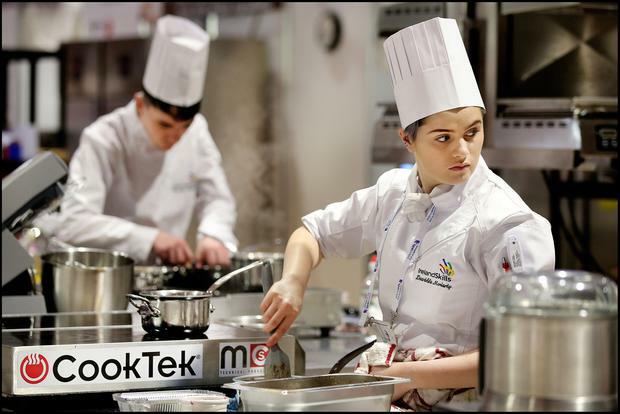 As the event opened, the 125 competitors were handed their tasks and will spend 18 hours, up to 5pm Saturday, competing for medals and a chance to represent Ireland in the 45th WorldSkills finals in Kazan, Russia in August. 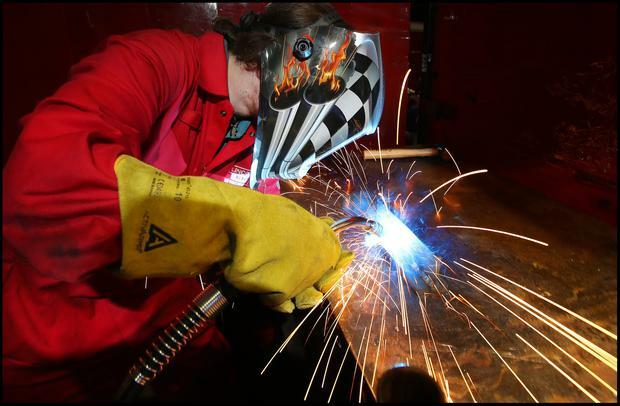 While Ireland has a proud tradition of entry in WorldSkills finals, this is the first time that all the national competitions have been gathered under one roof. Cookery examiner Kevin Ward of Athlone Institute of Technology described it as “very like Masterchef, but three days of it"
The cookery competitors face three daily tasks against the clock, a soup starter, lamb main course and a lemon tart dessert on the menu today. Carpentry examiner Anthony Clare of Letterfrack GMIT said competitors had to create structure in wood, with a floor, walls and a quite complex roof. "Today they are drawing, tomorrow they will cut and them Saturday they will assemble. It’s extremely complex, and if the drawings are wrong, well it all goes wrong." Irish champion metal turner of 1967, 71-year-old Paul Kennedy, who won a bronze at the world finals in Madrid, paid a visit to Simmonscourt today to cheer on the competitors. He showed off his bronze medal to the two youngest competitors, Alanagh O'Sullivan (17) of Lixnaw and Marion King 18, Killarney, both Co Kerry and who both competing in the beauty therapy category. He recalled how his fellow competitors at the 1967 world finals “barely knew where I was from", and how, in that era, "I couldn't ring home to tell my parents I had won a medal; we didn't have mobile phones then". More than 5,500 second-level students thronged Simmonscourt today to watch the competition and seek inspiration about future career choices. Heavy interest from schools has also made tomorrow a sell-out, while families are being encouraged to pay a visit on Saturday and get a flavour of the non-CAO options available for school-leavers and others. President Michael D Higgins will be among those attending on Saturday. The three day expo includes exhibits by more than 100 employers, opportunities to meet career professionals and companies currently hiring apprentices, and plenty of scope to ‘try a skill'. Among the employers, education institutions and other organisations represented at the event are SISK, The Designer Group, CIF, The Grafton Group, Lufthansa, the ESB, Failte Ireland, Sodexo, Irish Aviation Authority, Jones Engineering, Bus Eireann, SIMI, the Insurance Institute and Dublin Aerospace, the Higher Education Authority, education and training boards , Galway Mayo IT and TU Dublin.